Ethiopian Airlines Flight 302 was a scheduled international passenger flight from Addis Ababa Bole International Airport in Ethiopia to Jomo Kenyatta International Airport in Nairobi, Kenya. On 10 March 2019, the Boeing 737 MAX 8 aircraft which operated the flight crashed near the town of Bishoftu six minutes after takeoff, killing all 157 people aboard. The cause of the accident is under investigation. Flight 302 is the deadliest accident involving an Ethiopian Airlines aircraft to date, surpassing the fatal hijacking of Flight 961 resulting in a crash near the Comoros in 1996. It is also the deadliest aircraft accident to occur in Ethiopia, surpassing the crash of an Ethiopian Air Force Antonov An-26 in 1982, which killed 73. The Boeing 737 MAX 8 model first flew on 29 January 2016 and entered service in 2017, making it one of the newest aircraft in Boeing's commercial airliner offerings, and the newest generation of Boeing 737. As of February 2019, 376 aircraft of this model have been produced and one other has crashed, Lion Air Flight 610 in Indonesia in October 2018. Following the accident, the Boeing 737 MAX series of aircraft was grounded by various airlines and government regulators worldwide. Flight 302 was a scheduled international passenger flight from Addis Ababa to Nairobi. The aircraft took off from Addis Ababa at 08:38 local time (05:38 UTC) with 149 passengers and 8 crew on board. One minute into the flight, the pilot reported a “flight control” problem but decided to continue the flight; three minutes into the flight the aircraft accelerated beyond its safety limits, and the pilot requested permission to return to Addis Ababa while the air traffic controllers had already been diverting other approaching flights. However, the aircraft then disappeared from radar screens and crashed at 08:44, six minutes after takeoff, having reached an altitude of about 9,000 feet MSL. Flight tracking data showed that the aircraft's altitude and rate of climb and descent were fluctuating. Several witnesses stated the plane trailed "white smoke" and made strange noises before crashing. The aircraft reportedly impacted the ground at nearly 700 mph. It crashed in the woreda (district) of Gimbichu, Oromia Region, near the town of Bishoftu, 62 kilometres (39 mi) southeast of Bole International Airport. Photographs of the accident site show a large crater with only small pieces of wreckage. There were no survivors. The aircraft was a Boeing 737 MAX 8, registered ET-AVJ (construction number 62450, manufacturer's serial number 7243), powered by two CFM International LEAP engines. The aircraft was manufactured in October 2018 and delivered on 15 November 2018, making it around four months old at the time of the accident. All passengers and crew on board, 157 in total, were killed in the accident. Many of the passengers were travelling to Nairobi to attend the fourth session of the United Nations Environment Assembly. Twelve of the victims worked for the United Nations (UN), and at least another seven had other UN affiliations. Both Addis Ababa and Nairobi have offices of UN agencies, and Addis Ababa has the head office of the African Union. Notable victims on-board included the Italian archaeologist and Councillor for Cultural Heritage of Sicily, Sebastiano Tusa, and Nigerian-Canadian academic Pius Adesanmi. It was originally reported that there were five Dutch victims, but this was later corrected to state that they were German. Slovak politician Anton Hrnko lost his wife and two children in the crash. A Greek man and an Emirati man missed the flight and avoided the disaster. The airline stated that one passenger had a United Nations laissez-passer. The captain of the plane was Yared Getachew, 29, who had been flying with the airline for almost nine years and had logged a total of 8,122 flight hours. He had been a Boeing 737-800 captain since November 2017, and Boeing 737 MAX since July 2018. At the time of the accident, he was the youngest captain at the airline. The first officer, Ahmed Nur Mohammod Nur, 25, was a recent graduate from the airline's academy with 361 flight hours logged. Ethiopian Prime Minister Abiy Ahmed offered his condolences to the families of the victims. Ethiopian Airlines CEO Tewolde Gebremariam visited the accident site, confirmed that there were no survivors and expressed sympathy and condolences. Boeing issued a statement of condolence. The Ethiopian parliament declared 11 March as a day of national mourning. During the opening of the fourth United Nations Environment Assembly in Nairobi, a minute of silence was observed in sympathy for the victims. President Muhammadu Buhari of Nigeria, in his condolence message on behalf of the government and the people of Nigeria, extended his sincere condolences to Prime Minister Abiy Ahmed of Ethiopia, the people of Ethiopia, Kenya, Canada, China and all other nations who lost citizens in the crash. On 11 March, the FAA commented that the Boeing 737 Max 8 model was airworthy. However, due to concerns on the operation of the aircraft, the FAA ordered Boeing to implement design changes, effective by April. It stated that Boeing "plans to update training requirements and flight crew manuals in response to the design change" to the aircraft's Maneuvering Characteristics Augmentation System (MCAS). The changes will also include enhancements to the activation of the MCAS and the angle of attack signal. Boeing stated that the upgrade was developed in response to the Lion Air crash but did not link it to the Ethiopian Airlines crash. On 19 March, the U.S. Secretary of Transportation, Elaine L. Chao, sent a memo to the U.S. Inspector General asking him to "proceed with an audit to compile an objective and detailed factual history of the activities that resulted in the certification of the Boeing 737-MAX 8 aircraft." Flight International commented that the accident would likely increase unease about the Boeing 737 MAX felt in the aftermath of the Lion Air Flight 610 accident in October 2018, which similarly occurred shortly after take-off and killed everyone aboard. Boeing shares dropped 11% over the weekend, and as of March 23 Boeing has lost more than $40 billion in market value since the crash, dropping some 14%. As a result of the accident and the Lion Air Flight 610 crash, which occurred five months prior to the Ethiopian crash, most airlines and countries began grounding the Boeing 737 MAX 8 (and in many cases all MAX variants) due to safety concerns. Ethiopian Airlines grounded their aircraft after the crash, followed by other operators of the 737 MAX. Aviation authorities also started grounding all MAX aircraft under their jurisdiction, including transiting flights, initially by the Civil Aviation Administration of China on 11 March 2018. Initially the United States Federal Aviation Administration (FAA) declined to ground 737 MAX aircraft under its jurisdiction. However between 11 and 13 March the majority of aviation authorities under the world started banning the aircraft. Eventually an emergency order was issued on 13 March grounding the aircraft worldwide after agreement between the FAA and Boeing. The Ethiopian Civil Aviation Authority (ECAA), the agency responsible for investigating civil aviation accidents in Ethiopia, has been investigating. The aircraft manufacturer, Boeing, stated that it is prepared to work with the United States National Transportation Safety Board and assist Ethiopian Airlines. The United States Federal Aviation Administration will also assist in the investigation. Both the cockpit voice recorder and the flight data recorder were recovered from the crash site on 11 March. U.S. officials urged Ethiopian Airlines officials to send the voice and data recorders to the United States for analysis, but airline officials told reporters that they had decided to send them to European safety experts instead. Representatives from Germany's Federal Bureau of Aircraft Accident Investigation said that Ethiopian authorities had contacted it about analyzing the flight recorders, but the agency declined because it did not have the software required. The French aviation accident investigation agency BEA announced that it would analyze the flight recorders from the flight. BEA received the flight recorders on 14 March. On 17 March, the Ethiopia’s transport minister Dagmawit Moges announced that "the black box has been found in a good condition that enabled us to extract almost all the data inside" and that the preliminary data retrieved from the flight data recorder show a clear similarity with those of Lion Air Flight 610 which crashed off Indonesia. On 13 March, the FAA announced that new evidence found on the crash site and satellite data on Flight 302 suggested that the aircraft might have suffered from the same problem which the aircraft operating Lion Air Flight 610 had suffered from. Investigators discovered the jackscrew that controlled the pitch angle of the horizontal stabilizer of Flight 302, was in the full "nose down" position. The finding suggested that, at the time of the crash, Flight 302 was configured to dive, similar to Lion Air Flight 610. Due to this finding, some experts in Indonesia suggested that the Indonesian National Transportation Safety Committee (NTSC) should cooperate with Flight 302's investigation team. Later on the evening, the NTSC offered assistance to Flight 302's investigation team, stating that the committee and the Indonesian Transportation Ministry would send investigators and representatives from the government to assist with the investigation of the crash. Ethiopian Airlines later said MCAS was “to the best of our knowledge” active when the aircraft crashed. On 4 April, the ECAA released a brief note on its Facebook page, providing preliminary findings. On 4 April the ECAA released the preliminary report on the crash. Several news reports claim that the MCAS system was disabled when the pilots used the stabilizer trim cut-out switches. The preliminary report does not specifically mention MCAS but rather states "approximately five seconds after the end of the ANU (aircraft nose up) stabilizer motion, a third instance of AND (aircraft nose down) automatic trim command occurred without any corresponding motion of the stabilizer, which is consistent with the stabilizer trim cutout switches were in the ‘’cutout’’ position". The preliminary report confirms the pilots were briefed on the new procedures Boeing put in place after the Lion Air crash and the FCOM bulletin from Boeing had been inserted in the FCOM (Flight Crew Operation Manual). 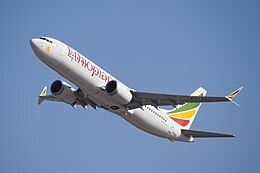 According to Ethiopian transport minister Dagmawit Moges, the crew "performed all the procedures repeatedly provided by the manufacturer but was not able to control the aircraft". The preliminary report confirms that the thrust remained at takeoff setting (94% N1) and the throttles did not move for the entire flight. Approximately one minute into the flight 238 kt (274 miles per hour) airspeed was selected. About 12 seconds later the autopilot disengaged. Although the crew apparently recognized the problem with MCAS and disabled it, they were not able to counteract successfully the high control column and trim forces generated by the excess speed. A data spike in the flight data led to speculations about a bird or other debris hitting the plane as it was taking off, shearing away the airflow sensor. These speculations were dismissed by Ethiopian Airlines, and Chief investigator Amdye Ayalew Fanta stated there was no indication of such damage. ^ a b c Hradecky, Simon. "Crash: Ethiopian B38M near Bishoftu on Mar 10th 2019, impacted terrain after departure". avherald.com. The Aviaiton Herald. Archived from the original on 11 March 2019. Retrieved 4 April 2019. ^ a b c d e "Ethiopian Airlines: 'No survivors' on crashed Boeing 737". BBC News. 10 March 2019. Archived from the original on 10 March 2019. Retrieved 10 March 2019. ^ Ranter, Harro. "Ethiopia air safety profile". aviation-safety.net. Archived from the original on 15 August 2018. Retrieved 10 March 2019. ^ "Boeing's 737 MAX takes wing with new engines, high hopes". The Seattle Times. 29 January 2016. Archived from the original on 19 February 2019. Retrieved 10 March 2019. ^ a b c d "Ethiopian Airlines flight ET302 crashes en route to Kenya". The National. Addis Ababa. Retrieved 10 March 2019. ^ "ET-AVJ Ethiopian Airlines Boeing 737-8 MAX". www.planespotters.net. ^ Gebrekidan, Selam; Glanz, James (14 March 2019). "Boeing 737 Max Hit Trouble Right Away, Pilot's Tense Radio Messages Show". The New York Times. ISSN 0362-4331. Retrieved 16 March 2019. ^ a b "ET-AVJ". Aviation Safety Network. Archived from the original on 11 March 2019. Retrieved 10 March 2019. ^ "Ethiopian Airlines flight to Nairobi crashes, deaths reported". www.aljazeera.com. Archived from the original on 10 March 2019. Retrieved 10 March 2019. ^ "Flightradar24 data regarding the crash of Ethiopian Airlines flight 302". Flightradar24 Blog. 10 March 2019. Archived from the original on 13 March 2019. Retrieved 11 March 2019. ^ Miriri, Duncan (12 March 2019). "Ethiopian plane smoked and shuddered before deadly plunge". Reuters. Retrieved 14 March 2019. ^ "Ethiopian Airlines flight crashes with 157 on board, fatalities feared". Times of India. Archived from the original on 10 March 2019. Retrieved 10 March 2019. ^ "Investigators at Ethiopian Airlines crash site look for answers". Al Jazeera. 10 March 2019. Archived from the original on 10 March 2019. Retrieved 10 March 2019. ^ "Ethiopian Airlines ET-AVJ (Boeing 737 Next Gen – MSN 62450) Airfleets aviation". www.airfleets.net. Archived from the original on 10 March 2019. Retrieved 10 March 2019. ^ "Ethiopian accident involves four-month old 737 Max". FlightGlobal. 10 March 2019. Archived from the original on 10 March 2019. Retrieved 10 March 2019. ^ a b "Accident Bulletin no. 3 Issued on March 10, 2019 at 4:59 PM". Ethiopian Airlines. 10 March 2019. Archived from the original on 10 March 2019. Retrieved 12 March 2019. ^ "Press Release Details - Ethiopian Airlines". www.ethiopianairlines.com. Retrieved 17 March 2019. ^ "Crashed Ethiopian plane carried at least 19 UN officials". The Sydney Morning Herald. 11 March 2019. Retrieved 11 March 2019. ^ "12 VN'ers onder slachtoffers crash Ethiopië" [12 United Nations among victims of crash in Ethiopia]. De Telegraaf. 10 March 2019. Retrieved 11 March 2019. ^ a b "'My lucky day': How one man missed flight". BBC News. 11 March 2019. At least 19 victims were affiliated with the United Nations. ^ Schemm, Paul; Kareem Fahim; Rick Noack. "'In deep grief': Aid workers, U.N. staff, tourists among victims in Ethiopia plane crash". ^ "Ethiopian Airlines plane crashes, no survivors, says airline boss". news.com.au. 10 March 2019. Archived from the original on 12 March 2019. Retrieved 10 March 2019. ^ "BREAKING: Nigeria's Pius Adesanmi Killed In Ethiopian Airlines Plane Crash". Sahara Reporters. 10 March 2019. Archived from the original on 11 March 2019. Retrieved 10 March 2019. ^ Newmark, Zack (10 March 2019). "No Dutch among 157 killed in Ethiopian Airlines crash". Netherlands Times. Archived from the original on 11 March 2019. Retrieved 10 March 2019. ^ Van Joolen, Olof; Kalkman, Niels (10 March 2019). "Ministerie: waarschijnlijk geen Nederlandse slachtoffers vliegramp Ethiopië" [Minister: Probably no Dutch victims in Ethiopian aircraft disaster]. De Telegraaf (in Dutch). Retrieved 10 March 2019. ^ Bekele, Kaleyesus (10 March 2019). "Crashed ET plane captain alerted ATC about technical problem". The Reporter Ethiopia. Retrieved 12 March 2019. ^ a b c d e f "Aircraft Accident Investigation Bureau Preliminary Report" (PDF). Ministry of Transport (Ethiopia). March 2019. Retrieved 4 April 2019. ^ a b Negroni, Christine (12 March 2019). "Ethiopian Airlines, With a Tradition of Training Pilots, Wants to Become Africa's Leading Carrier". The New York Times. Retrieved 12 March 2019. ^ "The Latest: Norwegian Refugee Council Says 2 Missing". The New York Times. The New York Times Company. Associated Press. 10 March 2019. ISSN 0362-4331. Retrieved 10 March 2019. ^ a b "Boeing Statement on Ethiopian Airlines Flight 302". Boeing. 10 March 2019. Archived from the original on 10 March 2019. Retrieved 10 March 2019. ^ "Ethiopia declares Monday a day of national mourning". SABC News. Retrieved 11 March 2019. ^ "WATCH: Minute of silence for Ethiopia crash at UN talks as search operation continues". News24. Retrieved 11 March 2019. ^ "Ethiopian air crash: Loss of 157 lives shocking – Buhari". punchng.com. Archived from the original on 11 March 2019. Retrieved 12 March 2019. ^ a b "Boeing design changes on 737 Max 8 aircraft to be made mandatory after crashes". The Guardian. Archived from the original on 12 March 2019. Retrieved 12 March 2019. ^ "US says Boeing 737 MAX safe to fly after Ethiopia crash". Channel News Asia. Retrieved 12 March 2019. ^ Toh, Mavis (12 March 2019). "Boeing to upgrade 737 Max flight control software". FlightGlobal. ^ "Memorandum from the Secretary" (PDF). US Department of Transportaion. Retrieved 25 March 2019. ^ "Ethiopian crash likely to aggravate unease over 737 Max". FlightGlobal. Retrieved 10 March 2019. ^ "Boeing has lost $26.6B in market value since Sunday's 737 Max crash". www.msn.com. Retrieved 13 March 2019. ^ Business, Jackie Wattles, CNN. "Boeing has lost $40 billion-plus in market value since Ethiopia crash". CNN. Retrieved 23 March 2019. ^ "Aerolineas, Aeromexico, and GOL ground their 737 MAX fleets". FlightGlobal. Retrieved 11 March 2019. ^ "CAL suspends Max 8 operations". www.caymanairways.com. Archived from the original on 11 March 2019. Retrieved 11 March 2019. ^ "Ethiopian Airlines grounds its Boeing 737 MAX 8 fleet". Reuters. Retrieved 11 March 2019. ^ "FAA: 'No basis' to order grounding of Boeing 737 MAX 8 despite calls worldwide". USA Today. 12 March 2019. Retrieved 12 March 2019. ^ "Boeing 737 MAX grounded in several countries following Ethiopian crash". Aviation Safety Network. Retrieved 11 March 2019. ^ "Sunwing suspends Boeing 737 Max 8 flights for 'evolving commercial reasons'". Retrieved 13 March 2019. ^ "S.Africa's Comair takes Boeing 737 MAX off schedules". Reuters. Retrieved 11 March 2019. ^ a b Wenxin, Fan; Moss, Trefor; Walland, Robert. "Indonesia Follows China in Grounding Boeing 737 MAX 8 Jets After Fatal Crash". The Wall Street Journal. Archived from the original on 11 March 2019. Retrieved 11 March 2019. ^ "FAA declines to ground Boeing 737 MAX 8, says unknown if two crashes are linked". CNN. Retrieved 11 March 2019. ^ "Europe and India join Boeing aircraft ban after crash". BBC News. 12 March 2019. Retrieved 12 March 2019. ^ "Indonesia to temporarily ground Boeing 737 MAX 8 jets for inspections". Reuters. Retrieved 11 March 2019. ^ "Malaysia declares 'no-fly zone' for Boeing 737 MAX 8". New Strait Times. Archived from the original on 12 March 2019. Retrieved 12 March 2019. ^ "Civil Aviation Authority of Mongolia (MCAA)". ^ "The nations, airlines grounding Boeing 737 MAX 8 aircraft". Channel News Asia. Retrieved 12 March 2019. ^ Kaur, Karamjit (12 March 2019). "Singapore suspends operations of all Boeing 737 Max 8 planes after Ethiopian Airlines crash". The Straits Times. Retrieved 12 March 2019. ^ "Scheuer sperrt deutschen Luftraum für Boeing 737 Max 8" (in German). 12 March 2019. Retrieved 12 March 2019. ^ "UK joins Boeing 737 Max aircraft ban". BBC News. 12 March 2019. Retrieved 12 March 2019. ^ "Boeing 737-MAX operations temporarily suspended". CASA. Retrieved 12 March 2019. ^ Hatch, Patrick (12 March 2019). "Australia grounds Boeing's 737 MAX in wake of fatal crashes". The Sydney Morning Herald. Retrieved 12 March 2019. ^ "CAA suspends operations of Boeing 737 MAX 8 aircraft both in and out of NZ". RNZ New Zealand. 13 March 2019. Retrieved 13 March 2019. ^ "US orders immediate grounding of Boeing 737 Max 8 and 9 planes". CNN. 14 March 2019. Retrieved 14 March 2019. ^ "Boeing 737 Max 8 planes grounded after Ethiopian crash". CNN. Retrieved 13 March 2019. ^ Gelles, David (27 March 2019). "As Boeing Confronted a Swelling Crisis, It Had Little to Say". The New York Times. Retrieved 27 March 2019. ^ Siddiqui, Faiz (10 March 2019). "U. S. authorities to assist in investigation of Ethiopian Airlines crash that killed 157". The Washington Post. Archived from the original on 11 March 2019. Retrieved 10 March 2019. ^ McKirdy, Euan; Berlinger, Joshua; Levenson, Eric. "Ethiopian Airlines plane crash". CNN. Archived from the original on 11 March 2019. Retrieved 11 March 2019. ^ York, Geoffrey (13 March 2019). "Ethiopia refuses to send black box from crashed Boeing 737 Max 8 to United States for analysis". The Globe and Mail. Retrieved 13 March 2019. ^ Busvine, Douglas (13 March 2019). "Germany says will not analyse Ethiopian Airlines black box". Reuters. Retrieved 13 March 2019. ^ Hepher, Tim (13 March 2019). "France to analyze Ethiopian Airlines flight recorders: spokesman". Reuters. Retrieved 14 March 2019. ^ Kiernan, Kristy. "The Black Boxes From Ethiopian Flight 302: What's On Them And What Investigators Will Look For". Forbes. Retrieved 16 March 2019. ^ "Data on Ethiopia crash: 'Clear similarity' to Indonesia crash". Politico. Retrieved 25 March 2019. ^ Mohammad Azka, Rinaldi. "Alasan KNKT Minta Dilibatkan Menginvestigasi Tragedi Ethiopian Airlines" [Reasons NTSC Asked To Be Involved In Investigating Ethiopian Airlines Tragedy] (in Indonesian). Bisnis. Archived from the original on 15 March 2019. Retrieved 14 March 2019. ^ Christy Rosana, Fransisca. "KNKT Tawarkan Bantuan Investigasi Kecelakaan Ethiopian Airlines" [NTSC Offers Ethiopian Airlines Accident Investigation Assistance] (in Indonesian). Tempo. Archived from the original on 15 March 2019. Retrieved 14 March 2019. ^ Stevis-Gridneff, Matina (25 March 2019). "Ethiopian Airlines Boss Says Stall-Prevention System Likely Activated on Crashed 737 MAX" – via www.wsj.com. ^ Freed, Jamie (4 April 2019). "Explainer: Ethiopia crash raises questions over handling of faults on Boeing 737 MAX". Reuters. Retrieved 5 April 2019. ^ Fehrm, Bjorn (3 April 2019). "ET302 used the Cut-Out switches to stop MCAS". Leeham News. Retrieved 4 April 2019. ^ "Ethiopian Airlines crew 'followed rules, unable to control jet'". Al Jazeera. 4 April 2019. Retrieved 5 April 2019. ^ a b Hepher, Tim; Johnson, Eric; Freed, Jamie (4 April 2019). "How excess speed, hasty commands and flawed software doomed an Ethiopian Airlines 737 MAX". Reuters. Retrieved 6 April 2019. ^ Levin, Alan; Johnsson, Julie; Schlangenstein, Mary (3 April 2019). "Ethiopia Crash Mystery Deepens: Pilots Initiated Boeing Protocol". Bloomberg. Retrieved 10 April 2019. ^ "British newspaper Mirror reports Ethiopian jet crash caused by bird-strike". 4 April 2019. Retrieved 10 April 2019. "Aircraft Accident Investigation Bureau Preliminary Report" (PDF). Ministry of Transport (Ethiopia). March 2019.